FOXROCK Cabinteely are looking to establish a legacy as they face into their first All-Ireland ladies’ football final at Parnell Park this weekend. Founded in 2005, the relatively new club has enjoyed a meteoric rise, moving successively closer to the national title over the last few seasons. Fox-Cab face Donaghmoyne with the Monaghan side having been their downfall at the semi-final stage last year. “We know a bit about them from last time,” captain Sarah Brophy told GazetteSport. “They’ve played a similar way for years and they’re still winning. She added: “It hurt to lose to them last year. But it’s been incremental progress for us, winning the All-Ireland at junior level, then getting Leinster, then the semi-final. This year it’s the final. Hopefully that extra little bit of experience will come through. Looking back at their impressive semi-final win against Mayo side Carnacon at the semi-final stage, Brophy recalled: “I think a few people thought ‘uh oh’ when we got the sin bin in the second half, but it seemed to drive us on, and we really brought it home from there. “We’re a small squad and we had a few people struggling a little with niggles after the semi-final, but everyone’s going to be fit. “We have to give it everything every game. Our approach will be ‘it’s just another game’, but we have to go for it every time we cross the line. The level’s so high, all the way from playing in Dublin early in the season up through to now. Brophy is also pleased that her side can enjoy the relative home comforts of Parnell Park. “It’s great that it’s in Dublin and we know the pitch. Foxrock Cabinteely host Monaghan side and reigning All-Ireland champions Donaghmoyne at 2.45pm at Parnell Park on Sunday, December 4. FOUR-time winners and holders against first-time finalists. That’s what lies in store on Sunday when Monaghan’s Donaghmoyne face off against Dublin side Foxrock-Cabinteely in the All-Ireland senior club final at Parnell Park. Donaghmoyne, who will be contesting their seventh final, will aim to do what they’ve never done before – successfully defend their title. Winners in 2015, 2012, 2009 and 2006, Donaghmoyne have also finished as beaten finalists in 2005 and 2013. Before beating Mourneabbey in last year’s final, Donaghmoyne saw off Foxrock-Cabinteely at the semi-final stage. And they’ll hope for a role reversal this time after beating Mourneabbey at the semi-final stage, with Foxrock-Cabinteely now providing the final opposition. Donaghmoyne won by four points when the 2016 finalists met at the penultimate stage last year but Foxrock-Cabinteely will feel confident of closing that gap with extra experience under their belts. But Donaghmoyne have been there, done that, and their ‘drive for five’ is very much alive. They have also managed to keep the core of the 2015 All-Ireland winning team, as 12 players who started at Parnell Park 12 months ago lined out against Mourneabbey in the semi-final. Goalkeeper Linda Martin was player of the match in last year’s final and Monaghan star Sharon Courtney has enjoyed another brilliant season in defence. At midfield, Sharon’s sister and fellow county player Cora stars alongside club captain Amanda Casey, a former long-serving Monaghan player who’s lined out for her club for almost 20 years, and she’s still only 32. Up front, another ex-Monaghan player, Catriona McConnell, is a bona-fide match-winner while defender Hazel Kingham has the potential to hurt Foxrock-Cabinteely with driving runs from deep. Kingham scored two sensational late points in the final victory over Mourneabbey last year and inflicted more damage on the same opposition with a semi-final goal. In 2005, Foxrock amalgamated with Cabinteely to become Foxrock-Cabinteely, and within two years, they were All-Ireland junior champions. Now, they’re just 60 minutes away from the biggest club prize in ladies football – and in their maiden senior final. 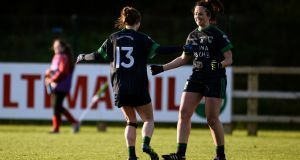 If anybody doubted Foxrock-Cabinteely’s credentials, they would have been transformed into believers when watching them put five-time All-Ireland senior winners Carnacon to the sword in a remarkable semi-final. Having been reduced to 14 players, Foxrock-Cabinteely showed incredible resolve to score two goals in as many minutes and turn the game on its head. Amy Ring and Amy Connolly, who can both can call upon recent experience at the top level with Dublin, combined for the first of those goals, Ring the scorer, before Ring turned provider for Louth’s Anne-Marie Murphy. Leading the Foxrock-Cabinteely charge from the half-back line once again will be Dublin duo Sinead Goldrick, recently crowned an All-Star, and Niamh Collins. Westmeath’s Fiona Claffey is another player Donaghmoyne will need to keep a close eye on while Laois native Laura Nerney also found the net against Carnacon. Foxrock-Cabinteely may call upon players from different counties but it’s very much a united effort when they hit the field of play. And they’ll need to be very much on their game to stop Donaghmoyne claiming back-to-back crowns. It has been a 19-year journey for Foxrock-Cabinteely’s Amy Ring to reach Sunday’s All-Ireland senior club final. Aged seven, en route to her cousin Ciara’s house in Cabinteely, Ring spotted a group playing ball on the local pitch. From the back seat she pleaded with her father Pat to stop the car before taking off across the road to join in. That journey will near its end at 2.45pm on Sunday in Parnell Park against Donaghmoyne of Monaghan, when Ring will be hoping she will get to lift the Dolores Tyrrell Memorial Cup for the first time in the club’s history. However, it has been a bit of bumpy ride getting there. There was a time when Ring and Cabinteely lined out in a championship final with just 13 players against the likes of Ballyboden-St Enda’s. It wasn’t sustainable, so in 2005 they amalgamated with Foxrock, and together two struggling clubs have managed to reach the greatest platform in women’s club football. The transition wasn’t without a few issues. They still don’t have a pitch to call their own, though the parish allows them to train at Cornelscourt and Kilbogget. However, with a united push by Ring’s father Pat and Philip McAnenly, they made it work. On Sunday Pat Ring will stand on the sideline as a selector alongside Peter Clarke and former Dublin star Angie McNally. He has never treated his daughter differently to any other player despite her talent in having played at every level for Dublin. “He brought us up well, that’s for sure,” Ring says about herself her older brother Ian. Ring knows about being grateful. Aged 19, she was diagnosed with patella tendinitis which meant surgery in the Santry Clinic and a year not playing. This season another injury led to a tough decision to step away from the Dublin senior set-up despite a good league performance. A grade three tear in her hamstring and groin in March meant Ring had to reassess her status with Dublin . . . and her priorities. She returned four months later at the start of August, and since then she has won a senior county and Leinster title. In the past, she has lost both, so to secure Foxrock-Cabinteely’s second ever provincial title last month was special, says Ring, who works as a merchandise planner for Primark at its global headquarters in Dublin. Last year Clarke’s side lost the All-Ireland semi-final to reigning champions Donaghmoyne; in this year’s equivalent fixture against Mayo’s Carnacon, they weren’t going to make the same mistake twice. With a player in the sin-bin and down two points in the dying minutes, a brilliant ball from Amy Connolly put Ring through on goal. A minute later, Ring turned provider for Anne-Marie Murphy and it was game over (4-9 to 2-11). “We knew we had it in us. After losing the semi-final last year, we needed to go one better. I think that helped our mentality when our backs were against the wall,” Ring says. “Some of our key players got scores that gave us a kick and we knew then we weren’t going to lie down. We wanted to right that wrong. “We were devastated to lose last year and it did take a while for the wounds to heal. We were more disappointed in ourselves, but we could have no arguments. Donaghmoyne deserved it. There has been no annual team-bonding session this time around. The year got away, but then again, the taste of defeat can build the greatest bond of all. On Sunday morning, Ring and her team-mates will meet for breakfast before making the 30-minute journey across to Parnell Park. It will mark the final leg of her 19-year journey, a journey, she hopes, will end as happily as it started. LGFA All-Ireland Senior Club Championship semi-final. for final between Foxrock-Cabinteely and Donaghmoyne. Dolores Tyrrell Memorial Cup on Sunday. semi-final last year, we needed to go one better." A sensational two-goal flurry in as many minutes - after they were reduced to 14 players - helped Foxrock-Cabinteely past ladies’ football superpower Carnacon and into their first ever All-Ireland club final. Dublin Allstar Sinead Goldrick had just tied the game, for the third time (2-8 each), in the 22nd minute when her side lost wing-back Lorna Fusciardi to the sin-bin. That immediately tipped the balance towards five-time All-Ireland champions Carnacon, featuring five Mayo seniors, including Cora Staunton, Allstar Fiona McHale and Martha Carter, with Amy Dowling also outstanding at Bray Emmets. But the two in-a-row Leinster champions produced a fantastic response, immediately scoring two goals despite their numerical disadvantage. A brilliant through ball from Amy Connolly put Amy Ring through for the first and, within a minute, Ring turned provider, crossing a ball for Anne-Marie Murphy to fist to the net to give them a sudden five-point lead. A point and free from Staunton kept Cornacon’s hopes alive and they continued to get chances. But a vital steal by Goldrick off Staunton, and an insurance point from Dowling, sealed the historic win for the Dubliners who only won their first Leinster title last season and now face Donaghmoyne on December 4th in a repeat of their 2015 semi-final. Foxrock-Cab lead by three (1-5 to 1-2) at half-time despite being hit by a 10th minute penalty, earned by Michelle Corbett and scored by 10-time Allstar Staunton. Their goalkeeper Laurie Ahern then pulled off a vital save from Dowling before the two Amys combined for Amy Connolly to grab their first goal after 21 minutes in a very tense first half. But the second half started with drama and never let up. Laura Nerney hit the net just four minutes after the restart, Dowling matched her two minutes later and then Mayo’s five-time All-Ireland club champions hit four unanswered points to go a point clear. Yet the Dubliners, with Goldrick operating as a holding midfielder, county colleague Niamh Collins marking Staunton in an excellent team defence and Westmeath star Laura Claffey also starring, never let their heads drop and pulled off a famous victory. Carnacon: M Higgins; A Loftus, S McGing, S Walshe; M Corbett, M Carter, E Flannery; F McHale, D Hughes (Capt); A Brennan, A Dowling (1-4), M McGing; M Corbett, C Staunton (1-7 0-4f 1-0 pen), N Beegan. Subs - Aisling Hughes for Corbett (27 mins), M Larkin for Brennan (45). Foxrock-Cabinteely: L Ahern; C Crotty, C Ni Mhurchadh, C O’Riordan; S Goldrick (0-1), N Collins, L Fusciardi; S Brophy (Capt), L Nerney (1-0); E McDonagh, AM Murphy (1-1), N Ryan; A Ring (1-4 0-4f), F Claffey (0-1), A Connolly (1-2). Substitutes: H O’Neill for Nerney (63). A sensational two-goal flurry in as many minutes - after they were reduced to 14 players - helped Foxrock-Cabinteely past ladies football superpower Carnacon and into their first All-Ireland club final. But the two in-a-row Leinster champions produced a fantastic response, immediately scoring two goals, through Amy Ring and Anne-Marie Murphy, despite their numerical disadvantage. Two points (one free) from Cora Staunton kept Cornacon's hopes alive but the Dubliners held on for a historic win. Scorers - Foxrock-Cabinteely: A Ring 1-4 (4f), A Connolly 1-2, AM Murphy 1-1, L Nerney 1-0, S Goldrick and F Claffey 0-1 each. Carnacon: C Staunton 1-7 (4f, 1pen), A Dowling 1-4. Carnacon - M Higgins; A Loftus, S McGing, S Walshe; M Corbett, M Carter, E Flannery; F McHale, D Hughes (capt); A Brennan, A Dowling, M McGing; M Corbett, C Staunton, N Beegan. Subs: Aisling Hughes for Corbett (27 mins), M Larkin for Brennan (45). Meanwhile, a sensational two-goal flurry in as many minutes — after being reduced to 14 players — helped Foxrock-Cabinteely past ladies’ football superpower Carnacon and into their first All-Ireland club decider. Dublin All-Star Sinead Goldrick had just tied the game, for the third time, at 2-8 each, in the 22nd minute when her side lost wing-back Lorna Fusciardi to the sin bin. That tipped the balance towards five-time All-Ireland champions Carnacon, featuring five Mayo seniors, including Cora Staunton, All-Star Fiona McHale, and Martha Carter, with Amy Dowling also outstanding at Bray Emmets. But the two-in-a-row Leinster champions produced a fantastic response, immediately scoring two goals despite their numerical disadvantage. A point and free from Staunton kept Carnacon’s hopes alive and they continued to get chances. But a vital steal by Goldrick off Staunton, and an insurance point from Dowling, sealed the historic win for the Dubliners who only won their first Leinster title last season and now face Donaghmoyne on December 4 in a repeat of their 2015 semi-final. Foxrock-Cab led by three (1-5 to 1-2) at half time despite being hit by a 10th-minute penalty, earned by Michelle Corbett and scored by 10-time All-Star Staunton. Their goalkeeper, Laurie Ahern, then pulled off a vital save from Dowling before the two Amys combined for Amy Connolly to grab their first goal after 21 minutes, in a tense first half. The second half started with drama and never let up. Laura Nerney hit the net just four minutes after the restart, Dowling matched her two minutes later, and then Mayo’s five-time All-Ireland club champions hit four unanswered points to go a point clear. Yet the Dubliners — with Goldrick operating as a holding midfielder, county colleague Niamh Collins marking Staunton in an excellent team defence, and Westmeath’s Laura Claffey also starring — never let their heads drop and pulled off a famous victory. FOXROCK Cabinteely kept their brilliant run of form rolling as they beat Sarsfields of Laois 4-13 to 3-9 in the semi-final of the Leinster ladies senior football championship. They will now take on Kildare side St Laurence’s in the final as they look to match their achievements of last year and secure a county and provincial championship double. Manager Pat Ring spoke to GazetteSport about his side’s win and performances this season. “We are absolutely delighted and very relieved because we knew going into the game it was going to be a tough one. Sarsfields, over the last number of years, won five out of the last six Laois championships and two of the last four Leinster championships so we knew what we were up against having beaten them in last year’s final. Ring is now expecting another tough challenge when they take to the field on the weekend of November 6 for the final against St Laurence’s in Kinnegad. Foxrock Cabinteely had a tough start to the season with injuries but the underage players they called up stepped up to the plate and did their club proud and they have scarcely looked back. “It has been marvellous considering that at the start of the season we had a number of injuries. We played our first league match in Dublin during the first week of April and were short 11 players so we had to bring players up from underage level. “It is difficult going playing one of the top teams in Dublin without 11 of your key players but those injuries had cleared up by the middle of June and since then we have been more or less injury free,” said Ring. When asked if teams had raised their games against his team this season because of last year, Ring was quick to agree. “They did. Last year in Leinster, we came in under the radar a little bit having not done well in Dublin since winning in 2012. Having gone to the semi-final of the All-Ireland last year, you can’t come in under the radar anymore with that so teams inside and outside Dublin all raised their game. FOXROCK Cabinteely’s Amy Connolly described it as a “dogfight” as she and her club cohorts combined to win the New Ireland Assurance Dublin ladies football championship title last Friday evening. It was the first time they had retained the senior crown, continuing their remarkable rise, as they beat St Brigid’s in the decider for a second successive year in the decider. Connolly was named player of the match for a blistering performance, scoring 1-4 in a typically all-action showing. It helped her side run up a 1-8 to 1-4 lead before Brigid’s fought back to within a couple of points before having a chance to win the game with the last kick, a free that saw 12 Foxrock players on the line to block the chance. Speaking about the victory, Connolly told FM104’s Declan Drake: “That was a dogfight at the end and could have gone either way. I am actually in shock a bit still; St Brigid’s really put it up to us. Reflecting on the dramatic finish to the tie, Connolly said that the end of the match could not come soon enough. “The second half wasn’t pretty but we still came out on top,” she said. “We knew it was one of the last kicks of the game so we had to throw our bodies on the line and were all back there. The club now have a Leinster championship to look forward after Dublin’s county footballers play their All-Ireland final against Cork in a couple of weeks time. And Connolly is hopeful of retaining that title too. It’s a view shared by team mate Sinead Goldrick. “We understand what an achievement it is for our club; its down to the management and all our players for the work that we put in. 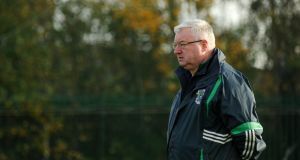 FOXROCK Cabinteely boss Pat Ring has admitted his hot favourites are expecting nothing less than the toughest of challenges ahead of the Dublin Ladies Senior Championship final against St Brigids at Parnell Park on Friday, September 2. Ring’s side have already beaten their opponents in the group stage of the Championship this season, and also overcame Brigid’s in the final last year. FoxCab, though, are taking nothing for granted, fitting in no less than four challenge games in the last three weeks as they prepare for Friday’s match. “Getting good clean ball to the forwards, that’s the aim,” Ring told GazetteSport. 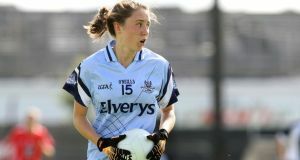 “We have to take into account that they have a really good quality goalkeeper [in Dublin goalkeeper Ciara Trant], and two or three other players that need looking after. Like normal, though, we’ll be focusing 95% on our own game. “We’ll take care of plans for those two or three players this week, do our homework, but the hard work is done. 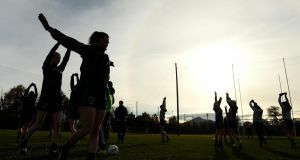 While Foxrock Cabinteely are now seen as the stand out club in Dublin Ladies’ football, it hasn’t always been that way, and Ring’s recollections of progress since they put forward a senior side in 2005 gives an inkling of what a third county win in five years might mean to the club. “We won a junior All Ireland in 2006,” Ring recalls, “and moved to intermediate level, winning a double in 2008. “That took us to the seniors. We were young, naive and inexperienced back then, and it took a couple of years to develop at senior level. We first took the title in 2012, and won again last year. “The youth teams remain an absolutely key part of the the club,” Ring explained, thanking his committee for the way they’ve supported and helped to develop the club. Niamh Collins, Niamh Ryan and one of the faces of ladies’ football, Sinead Goldrick, all turned out for Dublin as they edged past Mayo in the All Ireland semi-final on Saturday, to reach yet another Croke Park finale. “The game’s getting bigger over recent years, and there’s more money behind it,” Ring says of ladies’ football, mentioning a recent €5,000 donation from a nearby Lidl. “Sinead has been a great servant to our club and she’s been right at the heart of it. It’s great to see. THE Foxrock Cabinteely trophy cabinet may be newer than most of their rivals’ in Dublin, but the southside club added a massive new member to it by winning the Leinster Championship on Saturday. Pat Ring’s side travelled to Clane to take on the heavily favoured Mountmellick Sarsfields in the provincial decider and came out 1-12 to 1-7 winners. A brilliant start was key to Foxcab’s win here as they led 0-10 to 0-3 at the break against a Sarsfields side looking for their third Leinster title in a row. Speaking in the wake of the final, Ring was in joyous mood with the win. “It’s a wonderful feeling,” he said. “It’s really only beginning to sink in now to be honest and when you have that little bit more time to think about it. For a club so young to be Leinster champions, it’s a huge act. For a club formed just 10 years ago, being crowned Leinster champions is a serious achievement as Ring stated, but it hasn’t been an easy ride to get here. “It’s taken huge commitment and lots of personal sacrifice. These girls have missed out on so much due to the time and effort they’ve put into this team but I think their faces after the final whistle showed it was worth it. “There was genuine emotion there, some were beaming from ear-to-ear, while some were genuinely upset, in a good way, especially those who were there in 2012, I suppose I was a bit emotional myself,” added the manager. While winning Leinster brings such a high to any club, thoughts will have already turned to the national glory as Fox Cab take on the mighty Donaghmoyne from Monaghan in their All-Ireland semi-final on November 22. “We’re into a different ball game now altogether,” said Ring. “Leinster is a huge competition to win but the All-Ireland is step-up again. Donaghmoyne are a seriously strong outfit. They’ve won two All-Ireland titles, have nine inter-county players and four or five All-Star’s in their ranks. “But, we are confident in our own ability and we will be going up to Monaghan looking to win the game. Dublin Ladies Senior Champions 2015. Isn’t that lovely to read! Friday August 7 2015 will go down as a red letter day in the club’s history as it was the day that the club won their second Dublin senior championship in 4 years. The opponents were St. Brigid’s; the final score was Foxrock Cabinteely 3-10 St. Brigid’s 2-1 and the match was refereed by Billy O’Connell from the Croi Ro Naofa club. Brigid’s opened the scoring after 4 minutes with a point from full-forward Elaine Kelly. This would be the only time in the game where Brigid’s were in the lead. Hannah Noonan got the teams level with an excellent point and this was followed by points from Amy Ring and Sinead Goldrick. Hannah Noonan was on the mark again with a point a few minutes later and just before half time Foxrock Cabinteely blitzed Brigid’s by scoring 1-3 without reply. Amy Ring got the all-important goal, Hannah Noonan scored 2 more points and Amy Connolly got the other point. The half time score was Foxrock Cabinteely 1-7 St. Brigid’s 0-1. The second half started with Foxrock Cabinteely dominating proceedings and Player of the Match Sinead Goldrick got her second point of the match a few minutes after the restart. Laura Nerney tagged on another point soon after and this was quickly followed by a remarkable goal from Amy Connolly. Amy’s goal was without doubt the score of the game as she took possession on the 45 and beat most of the St. Brigid’s defenders to blast the ball past her Dublin team mate Ciara Trant. Foxrock Cabinteely were awarded a penalty a minute later when Amy Ring was fouled and Anne Marie Murphy took the spot kick and slotted it comfortably past the Brigid’s keeper. Amy Connolly finished off the Foxrock Cabinteely scoring with a point. St. Brigid’s never gave up and this perseverance was rewarded with 2 goals before the end of the game. Billy O’Connell blew the final whistle to bring proceedings to and end and players, management and supporters rushed onto the pitch to savour the moment. A little while later the team made their way to the presentation area where Sinead Goldrick was named as Player of the Game. A few moments later team captain Fiona Claffey was presented with The Michael Murphy Cup to thunderous roars from the many Foxrock Cabinteely supporters. The panel for the game was: Carol Manning, Nuala Mohan, Aedin Murray, Sinead Delahunty, Sinead Goldrick, Sarah Brophy, Fiona Claffey (Capt. ), Marla Candon, Laura Nerney, Niamh Collins, Anne-Marie Murphy, Ciara O’Riordan, Amy Ring, Hannah Noonan, Amy Connolly, Ellen Dooley, Ciara Crotty, Niamh Ryan, Lorna Fusciardi, Laurie Ahern, Ciara Murphy, Cara Cooke, Elaine Bolger, Sinead Loughran, Eimear O'Herlihy, Hannah Foster Ryan, Hannah O’Neill, Tarah O’Sullivan, Olivia Crosson and Emma McDonagh. A sample of photos from the game are available here on the club website. Thanks to Mitchell Brophy for sharing these. Members can view more of Mitchell’s portfolio by visiting his Facebook page. A WEEK on from being crowned Dublin senior ladies football champions, Foxrock Cabinteely manager Pat Ring is on a high after his side’s absolutely dominating performance in the final. The Foxrock side hammered St Brigid’s 3-10 to 2-1 in the final last Sunday in Parnell Park. The margin of victory was reduced by two Brigid’s goals late in the second half after the score at half-time was 1-7 to 0-1 in Rice’s sides favour. But did the manner of victory surprise the Foxrock boss? “It did to be honest,” he said. “You could see that some of our players were quite nervous going into it but I suppose once they got on the field they just settled almost immediately. Foxrock Cabinteely won the championship in 2012, but missed out on the knock-out stages the following year before losing to Na Fianna in the 2014 final. This victory was aided by the massive influence Cabo’s inter-county stars have on the panel, with Amy Connolly, Hannah Noonan and in particular Sinead Goldrick performing yet again when it really matters. Goldrick was named player of the match as Dublin were crowned Leinster champions just weeks ago, and she glittered again here. The season is far from over for Rice’s side, however, with a couple of massive fixtures on the horizon. “We’ve still got a couple of league games left, we’re top of the table so obviously we want to stay up there,” he said. The senior team had a very early start on Saturday morning last in their second outing this year in a 7's tournaments. Having brought home the silverware from the Crossmaglen 7's in February, a different mix of players again travelled north of the border to Lurgan last Saturday. Only 6 of the players from the Crossmaglen outing were available on the day. Ciara Murphy, Marla Candon, Cara Cooke, Sarah Brophy, Anne-Marie Murphy and Emma Barry. However Ciara Crotty, Sinead Loughran, Olivia Crosson, Lorna Fusciardi and Sinead Delahunty were available to complete the squad for the day. The draw saw us in a tough group, and we got the worst possible start with a defeat to Ulster club runners up Donaghmoyne of Monaghan. The players quickly recovered the situation with impressive victories against Sarsfields of Armagh and St Christophers of Leeds. That left us in in second place in group 1, and were drawn against group 3 winners Truagh of Monaghan in the 1/4 final. This was an epic encounter with no more than 2/3 points between the teams at any stage. Our girls came through by two points with a measured, skilful and flawless performance. That led to a semi-final place against another Monaghan team, Emyvale. This was a cracking encounter that ebbed and flowed for the full 20 minutes with the Monaghan outfit coming through in the end by 5 points. It was a marvellous day throughout. The 11 players were a credit to themselves, their team, and our club. The smiles at the end confirmed that everybody had done their best and had represented our club with pride, honesty and dignity. Such was the standard of our displays on the day, that we received no less than three offers from other club sides to play in challenge games in the weeks ahead. The eventual winners, Donaghamoyne, came from our initial group, and the team that defeated us in the first game. They were worthy winners. A huge thank you to Peter, Ena, Mitchell and Margaret for their support and hard work throughout the day. The real heroes were the 11 players that again represented our club with distinction.